Very nice! what kind of fly did she eat? So, did you start out on other fish on the fly, or go straight to tarpon? I've been thinking about trying to do that myself. it always seems like $ goes to boat repairs, gear repairs, etc... and I still do not have a fly fishing outfit. someday I'll pick up a nice used one. Both fish we were finally able to get eats from were on a "Black Death" fly. I went exclusively "fly" about 18 months ago after picking up a used 8wt from a guide buddy. Putting a fly in front of a big tarpon is WAY more intimidating than the snook, reds, trout, or cobia I've chased previously. As my partner joked this past Friday...its kind of like that first time you're about to "hook up" with your first girlfriend...its totally a "HOLY @$#%...this is really going to happen!" experience. It's July, the tarpon are all gone now. Is there a guide who specializes in late summer tarpon? Any recommendations? Took my buddy's out to AMI and boated his first **** 100+. 10 mins later we got destroyed by a 150+ in just a few seconds. So, once again, while redfishing after a dud of a morning tarpon hunting, we tried for reds briefly, on a spoil island in the flats.. I cut a couple crabs and put em out and while cutting up another crab I notice tarpon rolling 15' from the side of the boat looking right at me. This is the 4th time this year I have seen the fish way up on the flats on an outgoing tide while redfishing with cut crabs and saw it last year too. We had a grunt out for snook and tossed a crab their way but nada. These fish are way too spooky to chase with a trolling motor and a push pole would even be tough as they can move. I have never tried cut crab for poons but have a suspicion that they could work in the right situation. The tarpon fishing has slowed for sure for us. We did get 3 really cool topwater hits on a ladyfish though. The 1st **** busted way up in the air with the lady fish, missing it and a 2nd **** nailed it coming half outta the water with some force and gulls were even in on it by now and swirl around the ladyfish told me we were not done, the 3rd **** grabbed it and, breaking off a chaffed leader. Again, limited out on tripletails. They have been the silver lining in most trips when poons are not playing fairly. The fish I've been working have been keyed in on lady fish as well as grunts. If you can get a small to medium-small purplish grass grunt it's game on. Of course, the usual pinfish have also produced. 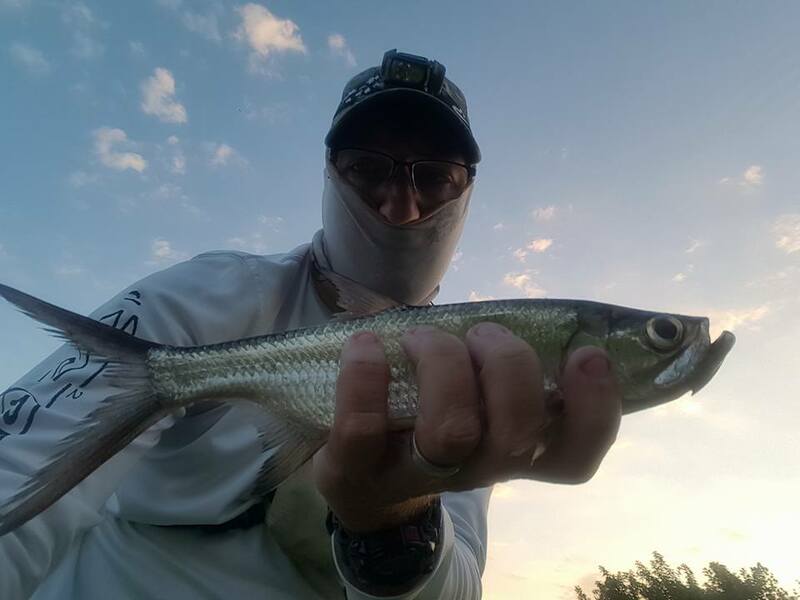 Don' think that a ladyfish is too big for a tarpon either, we have caught them on 24inch ladyfish, I am talking monster ladies. Hooked some very nice fish on lady fish this year. Size doesn't matter to much just make sure to use a bigger hook on the bigger baits. The fish are on the beaches but man is it hot out. We've been whipping fish in record time due to the water temp. Fish are at Egmont for those that care this week will probably be pretty decent. No one knows a guide who specializes in late summer tarpon? Jim Lemke does upper bay. Yup. If they are around, he'll be on them. Here's a tip for those wanting to put the time in and search for tarpon this time of year - the best spots to fish for tarpon are the ones where they do not roll. Many times when we fish these areas, you will see them pop a bait on the surface feeding, but not rolling that frequently. The best way to dial a spot in is to fish it on different tides and times of day to figure out when the fish will be there. It could be that fish are only in the area at the top of a high tide combined with a solunar period, or when fry baits are around and the water is clear, or when the wind blows from the south and its an outgoing tide with dirty water. Once you have a spot dialed, move to another area in your search and begin the process over again. Pretty soon you will have different areas that you can fish depending on the water clarity, bait movement, wind, tide, etc. and be able to successfully target tarpon any day during the warm months of the year. Figuring out where the fish live is a part of the equation, but the more important details lie in the granularity of all the other contributing factors. Figuring out how to dial it up is largely why most psychos fish for a fish that you can't eat and it extremely difficult to figure out. Then, as always, just when you think you have it figured out, the fish leave, or you get a curveball and are left there scratching your nose wondering what the hell happened. Rode around a bit yesterday to see what was up and saw a few fish in the passes but just a few. Egmont was dry of crabs. Didn't see a single crab flushing. White bait is thick as a mother all over right now which is good. Landed one fish Wednesday caught on a pilchard. Some great fly anglers from all over the state showed up. Benefits go to Bonefish Tarpon Trust and Project Healing Waters. Fishing started approx 8:30pm on Friday and went through approx 3:00pm on Sunday. It was a marathon, not a sprint. Tarpon season is officially over for me. Time to start tying for winter reds. Was out last Sunday and landed a double header at the same time. Both fish around 90lbs. Soon it will all be over. Get some in a hurry. In never really ends. It just gets more challenging and rewarding. My favorite two fish of the last year were caught on New Year's Eve and a couple days later. I'd rather fish for tarpon for a week and not catch one than fish for snook/redfish/trout and catch a hundred of them. I'd rather fish for tarpon for a week and not catch one than fish for snook/redfish/trout and catch a hundred of them. 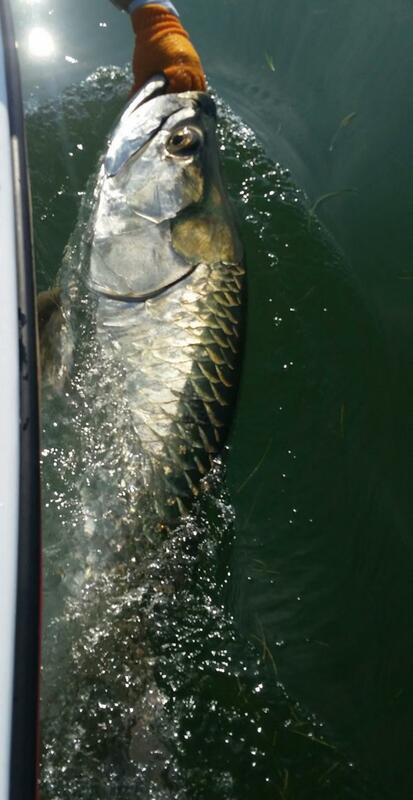 Friends don't let friends fish for redfish when there are tarpon around. That is just nonsense!! Nooooooo while not nearly as exciting the schooling / tailing bull reds are pretty fun on light tackle.